Loki Hostel is not for everyone. 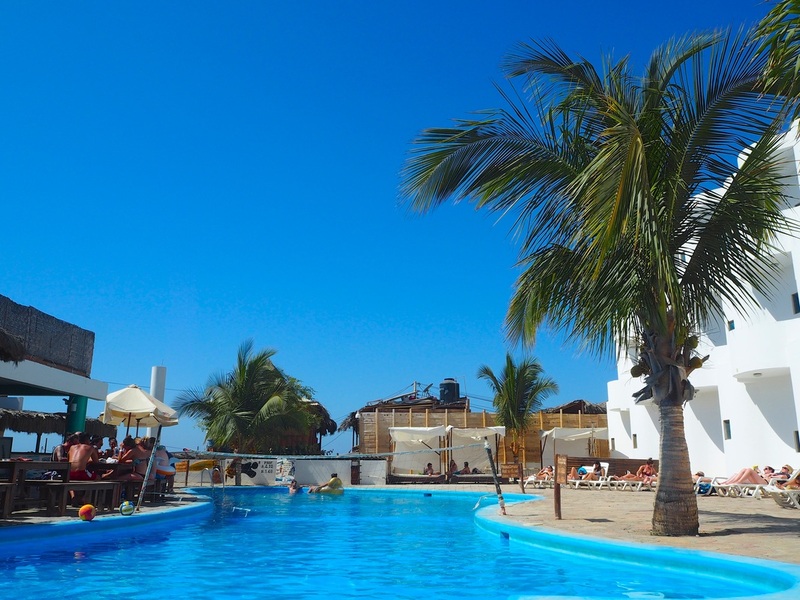 In fact the hostel in Mancora is just one of their five hostels throughout South America and from what I have heard, all are equally as intense as each other. Having said that, we only stayed at Loki Mancora and this review is based solely on our experience there. Mancora is a very small town on the north coast of Peru, located only 2 hours south of the Ecuadorian border and yet some 14 hours north of Peru’s capital city, Lima. Mancora is surrounded by desert and sandy cliffs and its main attraction is the beach which has reasonable surf throughout the year. Coming from Australia, the beach, while pleasant, was nothing to write home about. It’s a nice long stretch of coastline but is littered with rubbish and the water is not particularly clear nor inviting. Overall, there is not a lot to do in Mancora other than party, and if you want to party, then Loki is the only place you want to be! Loki Hostel, is listed as one of Lonely Planet’s top hostels in South America, and rightly so. The hostel has a handful of private rooms and the rest is made up of dormitories. Some are female only while the majority are mixed and range from four to ten beds per room. We stayed in a six bed dorm and were lucky enough to only ever have five awesome people in it throughout our stay. Rather than being the usual creaking and groaning bunk beds, each dorm bed in Loki is a sturdy bed actually built into the room. Every bed has it’s own locker large enough to fit almost any sized backpack and with two power points so all valuables can be charged in the safety and security of your own personal locker. The beds are all King Singles and are wonderfully soft compared to normal hostel beds. Every dormitory also has it’s own private toilet and shower (separate) so you are only sharing with the people in your dorm and there’s no waiting for the toilet while someone is in the shower – genius! All rooms in the hostel are cleaned spotlessly everyday and fans are provided in all rooms, however the entirely concrete building generally stays quite cool throughout the day and night. The entire hostel is built like a resort. The rooms are on one side of the property, while the bar, restaurant and reception are on the other. The centre point of the hostel grounds is the wonderfully refreshing outdoor pool surrounded by day beds and hammocks. It really is a unique find in a hostel and in many ways makes the stay worthwhile even just to relax around a pool for a few days. Breakfast in included in the room rate but isn’t really worth their time. It sounds good to the tight arse backpacker, however the bread was rock hard and when the whole breakfast is bread and spreads with a banana, stale bread kinda kills the whole meal! The free coffee and tea however, was definitely given a run for its money! The restaurant serves reasonably priced local and western food, though in my opinion there is much better quality and value to be found just a short walk away on the main walking street. As for security, every guest of the hostel must wear a wristband which is checked every time you enter the premises. 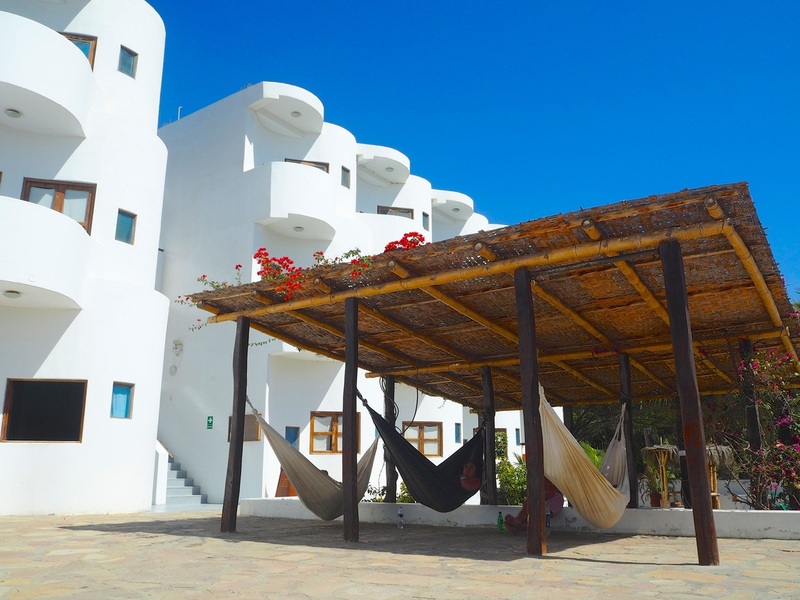 The entire property is surrounded by high walls providing not only a resort-like atmosphere complete with gardens full of hammocks but also the peace of mind knowing that the front gate is manned 24 hours a day so everyone within the hostel has paid to be there. While petty crimes are certainly not above backpackers, it is a reassuring sign in such a remote town of a country where foreigners and locals alike should always be on their guard in regards to personal safety and security. So, finally, the reason most people visit Loki Mancora. The parties. In as few words as possible, they are all day, everyday and unrelenting! When a hostel bar has two happy hours a day, you know it’s going to create a loose party atmosphere. Every day or night, the hostel organizes some sort of event or activity. While we were there it was a round robin of Table Tennis the first day, Beer Pong the following night and a Diving/Bombing Competition in the pool the next. All of course spurred on by the offer of free drinks at the bar for the winners! Don’t expect any early nights in this hostel because the music from the bar goes until all hours, so you really need to bring good ear plugs or party til close if you want to sleep in silence! If you want to meet and mingle with other travellers for a short time, a long time or everything in between, then this is the place to do it. But a word of warning – Have a time limit for your stay at this place. It’s fun, but brutal!